The "Across A Deadly Field - War in the East" scenario book includes an excellent mini-campaign based upon Gen. Meade's "Pipe Creek Circular". The document was sent to his Corps commanders and outlined in detail what may have been Gen. Meade's preferred "Gettysburg" battle scheme - a defensive engagement along Pipe Creek. This mini-campaign explores that possibility. 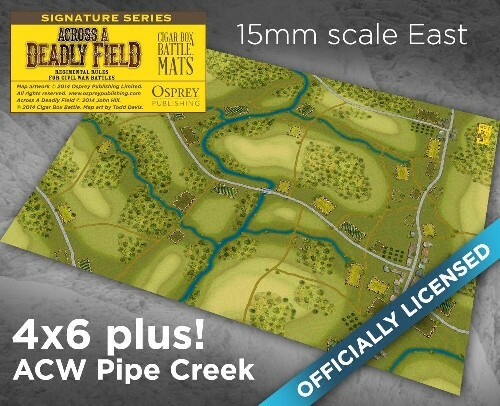 This mat represents the eastern half of the Pipe Creek Deployment Map and would work well for 10mm - 15mm figures. It will connect to the "Pipe Creek - West" mat to create a large battlefield! Artwork by Todd Davis.